Oh wait, no, I didn’t murder anyone in my living room. I just watched some movies. Over the past week, in my mission to watch all the movies on the Top 250 IMDb list, I have watched Black Swan, Inglourious Basterds, Dial M for Murder, Gandhi, and The Godfather Part II. Obviously, I didn’t exactly rush out to see this one. It has taken me until now to worship at the altar of Natalie Portman. Oh, I thought she was a pretty good actress, for sure, but no performance she had delivered had ever blown me away. No, not even in Star Wars, can you believe it. That has all changed with Black Swan. I was actually angry with myself for not seeing this earlier. For once, I wished I had listened to the hype. Natalie’s performance, and the movie itself, mimics its subject matter. It is exactly like a ballet, perfectly executed. As Natalie’s character Nina loses herself more and more in the dance and her quest to find the Black Swan, the dark side within herself, I found myself sitting on my couch, finding my anger over so many things that had happened in the past year of my own life. Seriously, I need to pay Natalie and director Darren Aronofsky for therapy. Natalie perfectly portrays Nina’s childlike vulnerability, ambition, social awkwardness, fear, and anger. The film forces the viewer out of their comfortable, distant role of the knowing aunt, tsk-tsking at Nina’s low self esteem and fragility, into her world of confusion, fear, and darkness. I think this film will stand the test of time and will still be regarded a classic in decades to come. I will be watching Aronofsky’s The Wrestler this week and can’t wait to see how he has told this story. As a welcome change to all the old mafia and western movies I’ve been watching from the list, I saw a second film from within the past few years this week. I have a complicated relationship with Quentin Tarantino. I so admire and relate to his nerdiness, his ability to reference such a diverse range of pop culture in his films (and his chatty-chat-chat interviews). What I find difficult to deal with are the graphic killings in his movies. And boy, wouldn’t he love to hear that. It’s not that I can’t take violence in movies. It’s a vital part of telling many stories. One of the earlier films I watched from the list was The Pianist, the story of a Jewish man during the Nazi occupation of his native Poland. Every murder in that movie shocked me and broke my heart, until I realised I’d spent an hour with my hand over my mouth and tears in my eyes. I visited Auschwitz and many other sites of Nazi atrocities during my trip earlier this year, and it was clear that the violence that occurred during this time was in no way exaggerated or glamourised in The Pianist. Perhaps this Eastern Europe trip and the conversations I had with people who either lived through the Nazi occupation or whose family members did, was not going to be the best place for me to come from to think this movie was awesome. It certainly simplifies a very painful history that still exists within living memory for many people in the world. Or maybe I’m just getting a little tired of Tarantino’s spaghetti western approach to telling any story. I guess this angle is the only way that Tarantino could feel he had some claim as storyteller about this subject matter. Coming up on the list is Django Unchained and I’m trying to keep an open mind, even though the approach seems to be about the same. Like most film lovers, I really really want to like Tarantino’s films. He is, after all, one of us. But I think his films need to grow up a little and stand on their own two feet. Hitchcock’s reputation as a flawless storyteller remains intact, in my mind, after watching this movie. One of his lesser-raved-about films, I had the same experience watching it as I have had with his others; I feel like I can almost hear him thinking about each shot, each line of dialogue, the placement of each prop. Like listening to a great album for the first time on vinyl, I turn a Hitchcock film up loud and hold my breath, not wanting to miss any subtle detail. 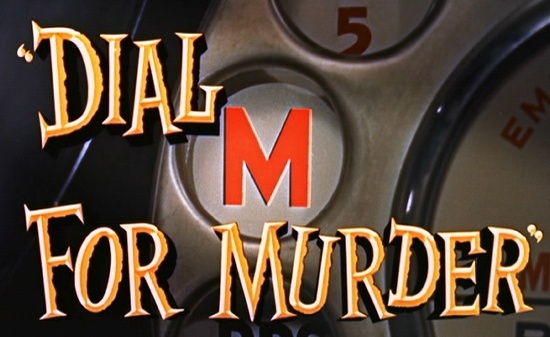 Dial M for Murder mostly takes place in a single room and I didn’t even realise this until the end. Hitchcock is such the master of suspense that I never once felt bored. Ray Milland as Tony Wendice is incredible. He inspires hate, empathy, admiration, and fear in the audience. And that voice! He sent shivers down my spine. Tony Wendice is a refreshing change for a villain; the only weapon he ever wields is his intelligence. I won’t say too much more about this one for those who haven’t seen it, but I thoroughly enjoyed it. Watching this movie has made me want to change my life! It makes you believe in the power of an idea and of committing to that idea at all costs. The real-life character of Gandhi makes it difficult to think of the film alone. The man is so inspiring and continues to carry such an empowering message of peace for people, even beyond his death, that watching the movie feels like a deeply spiritual experience. However, thinking this way, I realised that this is evidence of how good the film is. Richard Attenborough knew he had an incredibly powerful subject for his film and just had to get out of the way. I watched an interview with the actor who portrayed Gandhi, Ben Kingsley, and he spoke of just copying Gandhi as best as he could from recordings. The scenes of Gandhi with the crowds were shot with Ben and the crowds. There was no digital combination of the two created later, they were really there together, giving Ben the sensation of what it must have felt like for the real Gandhi. This movie beautifully shows that when you have an incredible story to tell, don’t try to tell it, don’t embellish, don’t sign to the audience that this is dramatic or important, applaud here, etc. Just tell it. So while I had just experienced a spiritual awakening about peace and tolerance, this film, which thematically centres on revenge, still lived up to the hype for me. And I totally agree that it’s better than the first Godfather. This is called the ‘De Niro Factor’. Robert De Niro is just so damn good at making you feel a connection, an empathy with his characters. In this movie, when he is standing outside the room where his baby is ill, your heart goes out to this young father, feeling helpless and desperate that he can’t properly provide and care for his family. The superiority of his performance, spoken almost entirely in Italian, made me long for more Vito Corleone, less Michael Corleone. Don’t get me wrong, Al Pacino plays Michael well, but he has become too much the hardened mob boss by this part of The Godfather story. The opportunities to feel empathy for his character (the rifts between Michael and his brother Fredo, and between him and his wife Kay) fall flat because it’s just so hard to see his vulnerability anymore. These experiences seem to affect his ego more than play on his fear of losing his family. The contrast between the young Vito and the older Michael though does help to tell the story and it’s obvious what Francis Ford Coppola was trying to achieve. Personally, however, I think the recipe was just ever so slightly off. A dash more Vito and a sprinkle of remaining vulnerability in Michael and it would have been perfect.